One of the things that makes Huntingdon one of the Coolest Small Towns in America is the fact that you don’t have to leave town to experience wilderness. 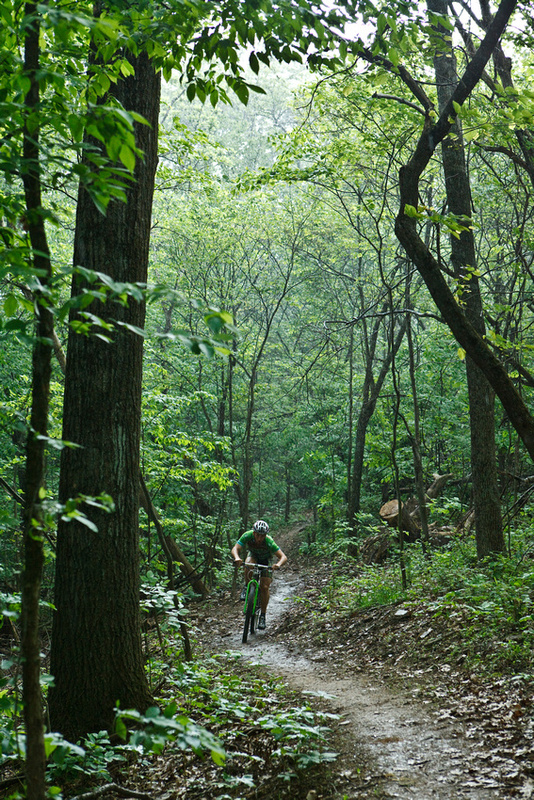 One of the coolest things about Huntingdon’s wilderness is how easy it is to find and access. 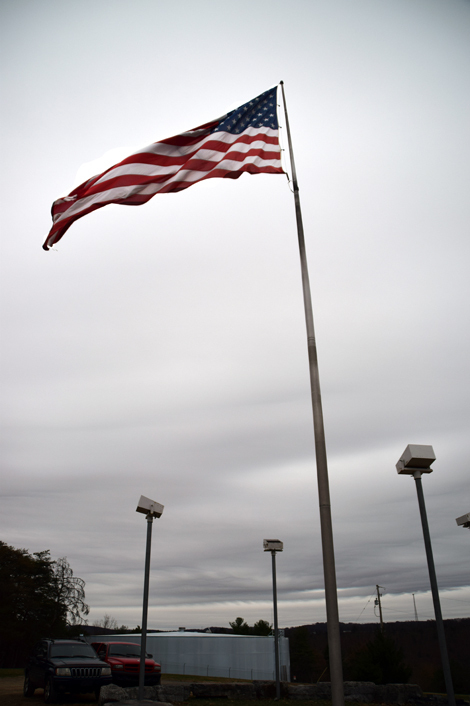 All you need to do is look from nearly anywhere in town (or within a couple of miles of town) for the giant American flag flying on a hilltop, and go there! The appropriately named Flagpole Hill and its trail system connects the enormous symbol of our nation with another cool landmark at the Juniata College Baker Evans Peace Chapel. 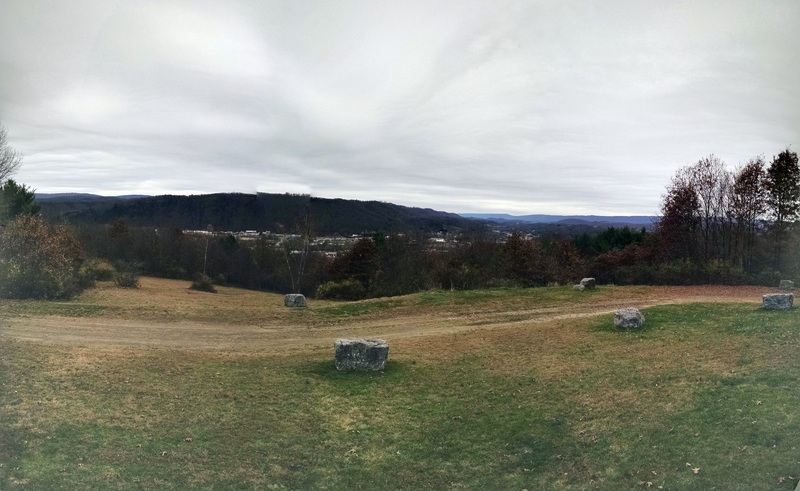 The day we hiked the Flagpole Hill Trails was an early November day that you might call “seasonable” for central Pennsylvania – temperatures in the low 50s, overcast and windy on the exposed hilltop. The leaves were nearly all removed from the tree limbs, opening up views that are not available in the summer, but also making the trail extremely noisy as our steps kicked through the 3-4 inch deep leaf litter. 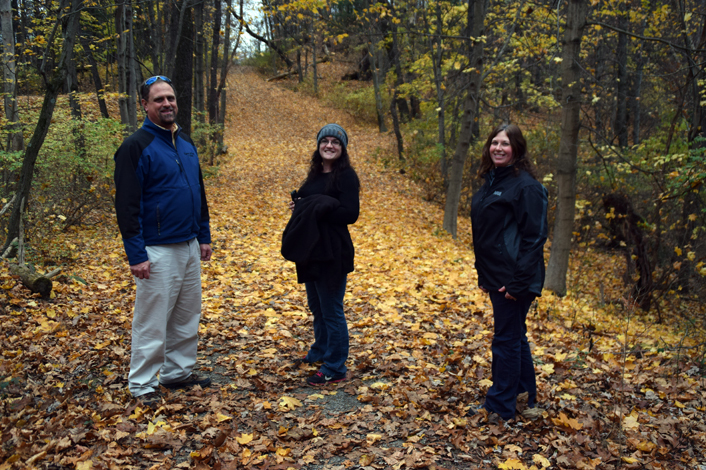 We set off to hike the closest loop to the flagpole consisting of Cemetery, Beech Tree and Oak trails. After making good time through the first leg, we added Bearcat to our hike, and still made it back to the cars within a little more than an hour. For their location the trails are surprisingly flat, largely following the contours of the hill rather than climbing or descending. As we returned to the vehicles we took in the view of Huntingdon, and all agreed it had been a good afternoon for a hike. The view of Huntingdon from Flagpole Hill. 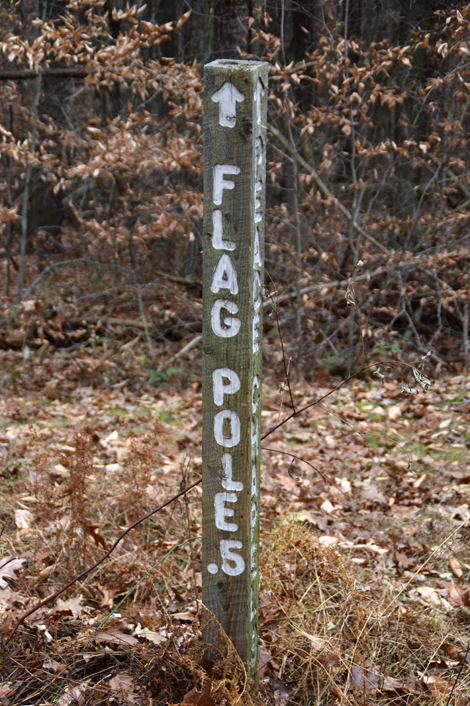 There are three parking areas to access the Flagpole Hill Trails. The one we used is the main trail head located at the north end of 5th Street, another can be found at the far northern corner of Riverview Cemetery (accessed from Standing Stone Avenue) at the intersection of Cemetery and Beech Tree trails. 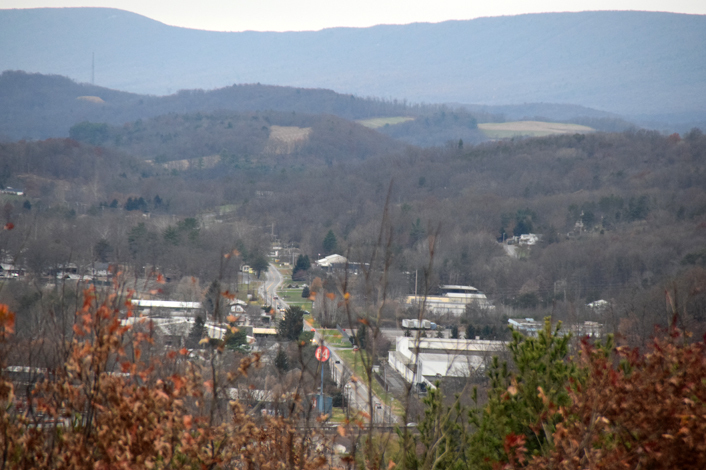 The other popular trail head for the network is from Peace Chapel Road near the Juniata College campus. Maps are usually available at the 5th Street and Peace Chapel Road trail heads, or at the Huntingdon Borough building on Washington Street. Victorian Era; Colonial Times presented by Moove In Self Storage; Back to the 50’s presented by Price Motor Sales; and Woodstock. Attendees are invited to wear costumes to join in the fun. 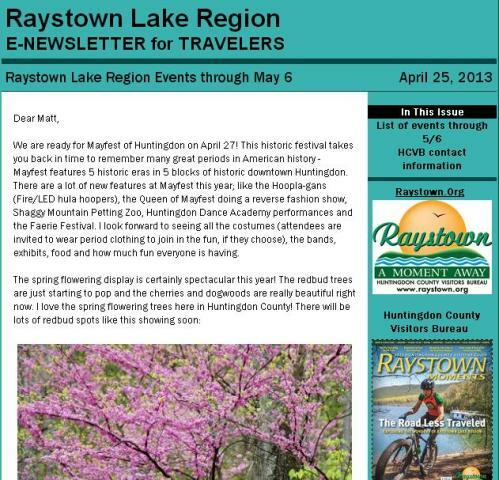 Stage schedules and other details are available at www.MayfestofHuntingdon.com. Italian Street Painting chalk art at its finest. Join renowned local artist Graham Curtis as he creates a temporary masterpiece in chalk on Washington Street in historic downtown Huntingdon PA. 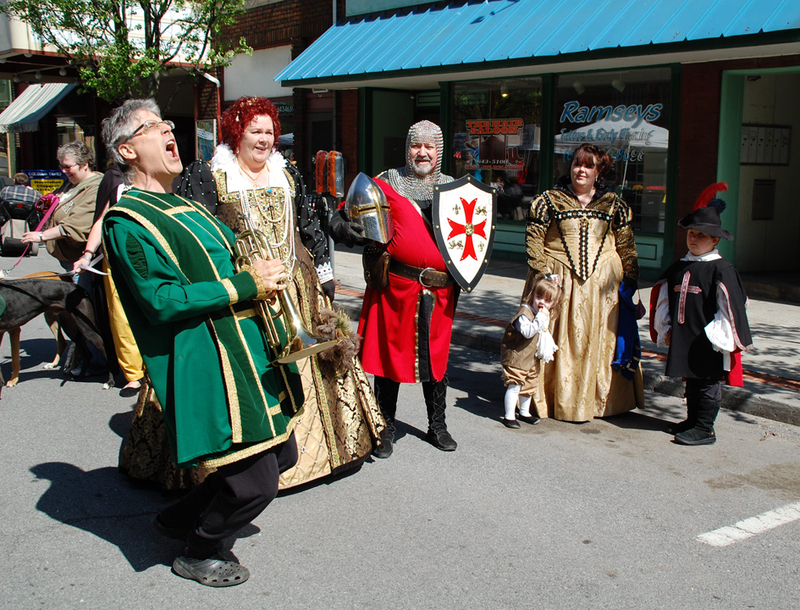 Check it out in the Mayfest Renaissance Faire section on April 28, 2012! Treat yourself to a truly versatile performer, GRAMMY Nominated Singer/Songwriter, and National Recording Artist – an entertainer whose engaging vocal style and infectious blend of good time music and humor continues to captivate audiences across the country. Ray has established himself as one of the most requested entertainers today. His travels have taken him from Camden, Maine, to Key West, Florida – Los Angeles, California, to Long Island, New York, and tours throughout Europe. He has performed with such legendary entertainers as Garth Brooks, Arlo Guthrie, Bill Monroe and Bob Hope, and he has toured with Willie Nelson and America, as well as many other major acts. Ray whips up a veritable feast of classic American songs and stirs in a healthy helping of humor for all audiences to enjoy. When he serves it up from center stage, he pulls you into a world of fun. Ray’s repertoire has grown to include some 900 songs and encompasses such a range of traditional classics, original songs and comedy that it is not hard to imagine why he has so much popular appeal to a wide variety of audiences. The Crustaceans are an eclectic group of aging rockers who enjoy playing popular classic rock songs. You will be tapping your feet and singing along to these rock-n-roll classics from the ‘60s through today. The Crustaceans will be performing at the Desert Garden Day Spa starting at 3pm on Saturday, April 28 (Washington & 5th) during Mayfest of Huntingdon. Square, round & line dancing with the popular State College group. Demonstrations and oh, yes, audience participation encouraged! 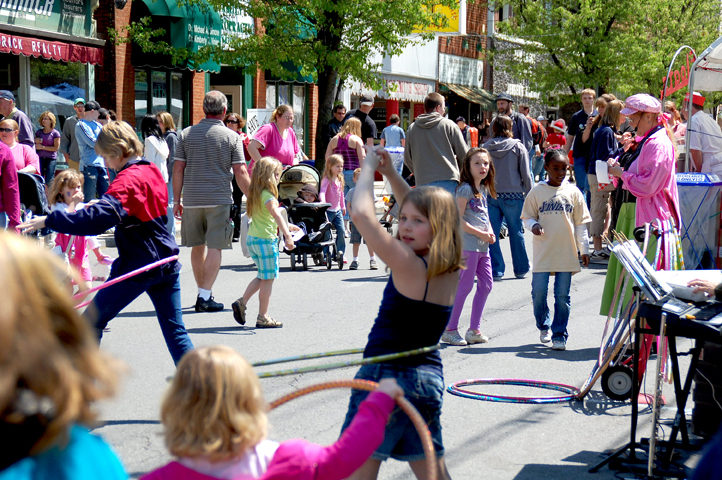 Entertainment on Every Block of Downtown Huntingdon PA During Mayfest! Stroll Through History on Washington Street in Huntingdon PA on April 28, 2012 DOWNTOWN HUNTINGDON STORES & RESTAURANTS are open. Stop in our shops! 12:30 50s Contest Hosted by Dan & Galla – between 6th & 7th Streets. (Near 613 Washington Street) Jitter Bug Contest, Bubble Gum Blowing, Pie Eating, Hula Hoops, FUN! Costume contest: Anyone in a costume can participate! Awards in many categories including most historically period correct and funniest costume. 1:00 Jen Bertiaux , live acoustic music at The Daily Scoop & Lil Debs Custom Stained Glass Art Studio, 4th & Penn St. Ancient Echoes performs Celtic Music & English County Dance group wears period costumes and interacts with the audience. The group includes Holly Foy who began playing guitar at age 11 and took up the hammered dulcimer in her late 20’s. She plays guitar, Irish skin drum (bodhran) and hammered dulcimer. Also performing will be Lisa McDivitt playing the recorder, harp and Irish floor harp. She has been a member of the SCA (Society of Creative Anachronism) for over 25 years and spends a week each summer at Pennsic, the largest Renaissance gathering in the world. Knighting Ceremony – Kids can become knighted by the Queen for doing a good deed. Parents can nominate their children for knighting. Times to be announced. 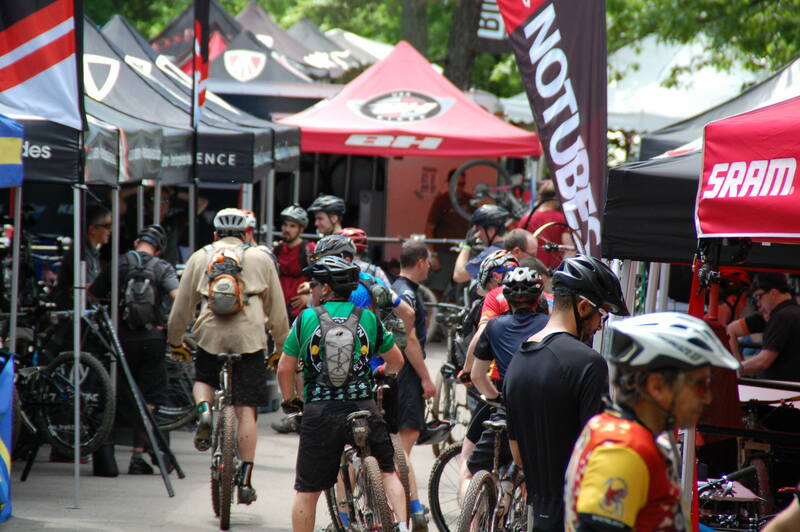 Don’t miss the zany outhouse race to benefit Relay for Life / Cancer Society, home-brewed beer demonstration and authentic blacksmith demonstration on this block. Dayze Gone Bye Conestoga Wagon Rides (Mayfest button required.) Start your ride in a horse-drawn vintage Conestoga wagon at the corner of 4th & Mifflin. Ride through historic downtown Huntingdon. The Toss n’ Turn Twirl & Dance Team performs jazzy routines that are sure to be crowd pleasers. Also, don’t miss the jump rope and four-square competition on this block. Performing throughout the day will be the 46th PA REGIMENT BAND (Logan Guard) formed in December 1995 by a group of musicians from the Altoona area. The bands desire is to honor the Logan Guard Militia from Lewistown, the 46th PA Volunteer Regiment, and the musicians from Birdsboro Community Band who enlisted together and maintained the morale of the troops with their music throughout the war. Don’t miss the DUNGEON on this block! Dan & Galla will perform 50s tunes at scheduled times during the day. They also host the fun 50s-style contests like jitter bug, bubble gum blowing, hula hoop, and pie eating! Don’t miss the COSTUME CONTEST hosted by Dan & Galla! Anyone in a costume can participate! Awards in many categories including most historically period correct and funniest costume. Don’t miss the Hootenanny with local musicians on this block! Mayfest of Huntingdon is chaired by volunteer Linda DeArmitt and produced by an all-volunteer Board of Directors. The event is sponsored by Price Motor Sales, Moove In Self Storage, Allensville Planing Mill, the Huntingdon County Visitor’s Bureau, The Borough of Huntingdon, Pennsylvania Council on the Arts, WTAJ-TV Channel 10, wearecentralpa.com, HUNNY 106.3, QWiK Rock, and many local businesses and individuals who donate to make this event possible. Many other sponsors are listed at www.mayfestofhuntingdon.com.